Den of thieves · One Book. One Author. One Hour. Notes on front fly leaf: Mike Milken, Ed B. Williams; Linda Robinson; Arthur Limon; Giuliani. Martin Siegal, 1977 invented golden parachute. Arbitrageurs. Securities crimes still beyond reach of law enforcement. Congress should enact precise criminal securities code--enact statutory definition/prohibition of insider trading--criminal ban on fraudulent disclosure packages. Ilan Reich/Robert Wilkis reported to federal penitentiary on same day. Reich became listless/withdrawn; Wilkis fraternized with other prisoners/exercise. James Dahl--remains multimillionaire; Mulheren continues splashy investments in Manhattan via Merrill Lynch and Bear, Sterns. Robert Freeman--active investor for whom little has changed. Dennis Levine--financial advisory firm, courted publicity--60 Minutes segment to air in Sept. 1991. Ivan Boesky--low profile, lives in France. Fines/penalties no dent in standard of living. Michael Milken--wears baseball cap; prison won't allow hairpiece. Has organization "Working for the American Dream" to improve image. Martin Siegal created computer camp for underprivileged Jacksonville high school students. Boesky's version of events consistently more accurate than Milken's. Never encountered a story so shrouded in secrecy. 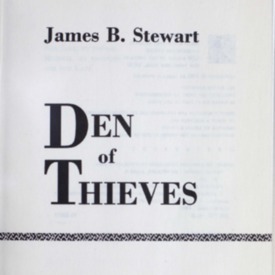 Stewart, James B, “Den of thieves ,” One Book. One Author. One Hour., accessed April 24, 2019, http://booknotes.gmu.edu/items/show/208. Program air date: November 24, 1991. How four men--Michael Milken, Ivan Boesky, Martin Siegel, Dennis Levine--"nearly destroyed Wall Street ... how they made billions and how they got caught." "Insider trading in securities--United States."